Cubic Zirconia Celtic Engagement Ring : LOVE2HAVE in the UK! 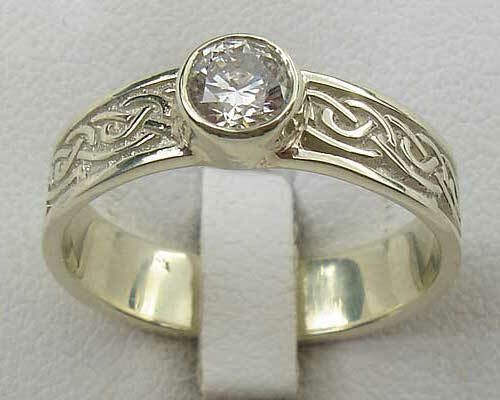 This particular Scottish made Celtic engagement ring is a traditional Scottish Celtic engagement ring shown here in 9ct white gold and set with a cubic zirconia (or CZ) stone that sparkles. Cubic zirconia is the ultimate alternative to a costly diamond Celtic ring which can cost up to five times the amount. That is a MASSIVE SAVING! The Celtic knot pattern features around the entire outer of the ring symbolising the never ending in the Celtic language. The ring measures approximately 5mm wide and the CZ stone 4.8mm in diameter. It is also available in purple amethyst and red garnet which are both also listed in this section. As mention above cubic zirconia is far, far cheaper than a real diamond but looks just as impressive. 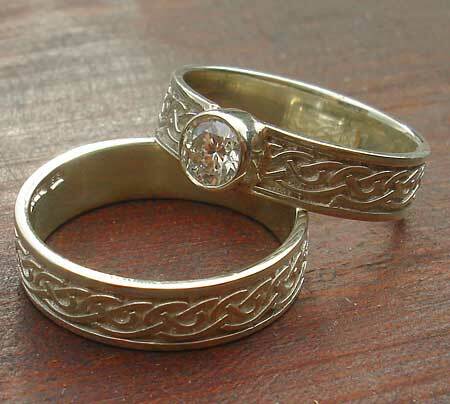 We have available also the matching plain Celtic band which therefore makes an attractive CZ Celtic bridal set for women. Metal(s)/Material(s) Available: 9ct yellow gold, 9ct white gold, 9ct rose gold. Gemstones(s) Available: 1 x cubic zirconia (or CZ) stone.